Below, a press release from NGNP Alliance. other processing facilities; and steam generation for oil sands recovery operations. SGL Group, Technology Insights, Toyo Tanso Co. Ltd., and Westinghouse. wide range of applications and distributed energy generation. Carnival 141 at Atomic Power Review! Atomic Power Review is proud to host the 141st Carnival of Nuclear Energy. This week has been one filled with news, and the major events of the week are reflected in this week's contributions. Which you'll see after you take a stab at APR's usual Carnival-related guessing game. What is this? It's fairly obvious to many what this is, generally - but the big question has to do with the actual plant site. Here is an enormous hint -- it's in Ohio. And now, the Carnival entries for this week! Big news this week in the pro-nuclear advocacy and outreach world was made with the announcement of the "Diary of a Nuclear Tourist" program, which is a function of the Nuclear Literacy Project. You can see the announcement of the project here, and a statement from one of the NLP / Diary project sponsors can be found here. As a result of this project, a new blog to track and report its various events has been launched, and one of that blog's entries leads off this week's Carnival. The Shifting Energy Narrative - Suzy Baker explores the change in environmentalist stance on nuclear power, and invites everyone to sideline old thoughts and habits for the sake of environment, of science, and of truth. Next, we have a Captain's Choice blog entry -- from a blog not yet featured on any Carnival! Ethos of Nuclear Reactor Safety - Greene examines four cornerstones that should be foremost in building a personal concept of reactor safety. APR note: I heard some of this information in a remarkable lecture Mr. Greene gave at the ANS 2012 Winter Meeting, and was very impressed. I am glad to add this blog to the roll call and look very much forward to reading through all of the previous posts. Thanks to Paul Bowersox of ANS for letting me know it exists! Daily Renewal Powers Up Nuclear Energy - AREVA CEO Mike Rencheck discusses why nuclear energy is such an important part of our overall power generating mix. The Nuclear Quarterback - AREVA's blog clearly counters a recent Forbes piece which used an NFL Quarterback analogy, showing why nuclear actually is a top choice in generating mix for a variety of reasons ignored in the original piece. Reducing Nuclear Construction Costs - Jim Hopf explores some ways, possibly controversial, that could be contributory to reducing construction costs of nuclear power plants. APR note: The 'comments' string on this post is fairly exciting. Chernobyl Wildlife Thriving: Its Possible Impact on Japan, or not? - A new report concerning the Chernobyl region says that the exclusion zone around the destroyed power plant has become a thriving wildlife refuge. Will the Japanese Press tell the Japanese public that Chernobyl wildlife is flourishing and previous fear-inducing studies may well have been flawed? I’m betting that nuclear fission will disprove Malthus once again - Rod Adams engaged in a Twitter discussion with a futurist who is skeptical about the ability of nuclear energy to stave off what he sees as a coming crash for the developed world economies. Sami Makelainen believes that crash is almost inevitable and will come because of a combination of limited resources of easily accessible hydrocarbons and the negative environmental impact that is an inevitable part of burning massive quantities of fossil fuels. Rod agrees that our present course is aiming in that direction, but he is confident that nuclear energy provides the opportunity for clear sailing provided a small turn is made in sufficient time. The two have composed a long term wager designed to bring flashbacks to those old enough remember reading about the 1980 bet between Paul Ehrlich (Malthusian) and Julian Simon (Cornucopian). Where's the real bottleneck for natural gas? Distribution. - The real limits to growth in natural gas as an electricity source lie not in limits on the commodity, but in its distribution capacity. Despite presently low commodity prices, limited pipeline capacity means that natural gas is still a very regional commodity; and it also means that the push to replace nuclear electricity with gas-fired plants is a grave economy folly. Cold Weather Winners and Losers on Vermont Grid - Who wins and who loses when the wholesale price for electricity goes above 20 cents in cold weather? HydroQuebec loses, because they closed Gentilly-2 and had to cut back on the power they send to the U S. Merchant generators win. Vermont utilities win, due to required revenue sharing from Vermont Yankee. This post has inspired related posts at other blogs, and has started an important conversation about natural gas prices and the role of nuclear energy. Meredith also submits Vermont Presents Backward Economic Arguments from ANS Nuclear Cafe - The state of Vermont appealed the federal court ruling that supported Vermont Yankee's continued operation, and enjoined the state from regulating nuclear safety. In appeals court, the state claimed that its reasons for shutting down Vermont Yankee were economic. Among other things, the state claimed that inexpensive nuclear power makes it hard for new plants to compete! This is a reason to close a power plant....it's too cost-effective? The state's arguments were completely backward. Angwin's post also contains many links to original material, such as court rulings and the audio of the appeals hearing. Money Down the Drain on Gentilly 2: Hydro Quebec would love to have the generating capacity of the now shut down Gentilly 2 plant back. APR note: This post was nominated by Meredith Angwin. Lifting the Ban on Uranium Mining is the Rational Decision - Democrats and so-called “environmentalists” hate uranium mining. Republicans in Southside Virginia hate uranium mining. And the silence from Virginia’s thriving nuclear industry on the issue of lifting the uranium mining moratorium in the Commonwealth is deafening. In an op/ed for the Richmond Times Dispatch FCW Publisher Andrea Jennetta exposes the ugly truth: the nuclear industry has no friends. Including itself. APR note - Andrea Jennetta's regular venue can be found by clicking here. The Jan. 25 post is the reprint of the above Op-Ed, but there are many other insightful and brutally honest posts to be found at this blog. That's it for this week's Carnival. We have THREE blogs appearing here this time which have never been linked to a Carnival before -- the brand new 'Diary of a Nuclear Tourist,' from the Nuclear Literacy Project; Sherrell R. Greene's blog 'Sustainable Energy Today,' and Andrea Jennetta's 'I Dig U Mining.' This 141st Carnival has also marked the return of the AREVA folks, which I for one am very glad to see. Now, the answer to "What is this?" The photo you saw above is the reactor building of the Piqua Nuclear Power Facility under construction in December, 1960. 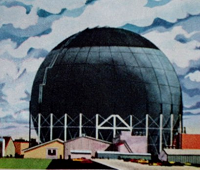 From the wire photo: "Containment shell of atomic reactor being built near Piqua, O., to produce electric power for that city of 20,000. 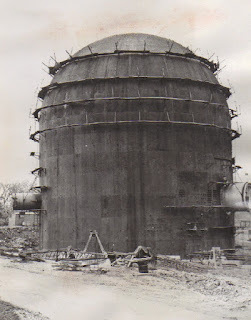 The shell, which is being constructed by Graver Tank and Manufacturing Company, a division of Union Tank Car Company, is 123 feet high and contains a protective inner wall of concrete seven feet thick." 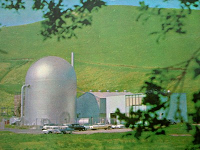 PNPF was the only organic moderated, organic cooled power reactor ever built for commercial operation. 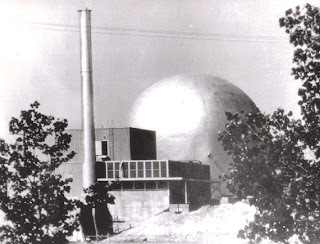 The reactor was developed and built by the Atomics International Division of North American Aviation, and used a substance called Santowax (a trade name of Monsanto) which was comprised of several isomers of what are described as aromatic hydrocarbons. To quote from Atomics International's characterization of the plant, the moderator / coolant was "an organic hydrocarbon liquid consisting of a mixture of ortho-, meta- and para- terphenyls (OMP.)" The actual trade name for the mixture was, in fact, "Santowax OMP." This substance was considered superior to various other coolant / moderator substances because it offered vastly superior corrosion behavior (almost no materials will corrode in its presence) and had a very high boiling point, making pressurization of the primary system either not required (theoretically) or very low, saving on construction cost. A further advantage, as a result of the noncorrosive behavior of this material, was that primary coolant activation was low - and thus, a reduction in shielding could be expected. Because of these considerations, the original A-I plans for a full scale organic moderated - cooled plant for commercial power production did not include a containment building. However, once the contract was set for Piqua, Ohio, the requirement for a full conventional containment was made, and the structure you saw above was constructed. Above, UPI Telephoto of PNPF, 6/11/63. "The nuclear power reactor in this plant at Piqua, O., achieved criticality (sustained a controlled chain reaction) 6/10 for the first time. The plant is the first to be powered by an organic reactor and the first built for a municipal power utility. The 11,400 electrical kilowatt plant, located about 28 miles north of Dayton on the Miami River, will be operated at full power in a few months." 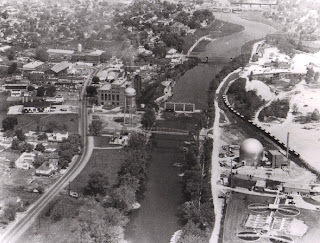 The PNPF did not contain its own power generating equipment; steam from the plant, supplied at conditions of 450 psia, 550F and 150,000 lb/hr was piped through a new bridge structure across the Miami River, and upstream shortly to the old Piqua power station, which could thus either provide power using its own fossil fired boilers or steam from the nuclear plant. 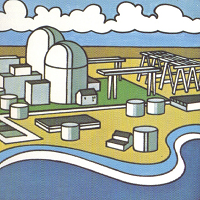 The locations of both the nuclear plant on the East bank, and the original power house on the West bank of the river are obvious in the following photo. Above, AP News Photo 4/18/66: "NUCLEAR POWER IN TOWN. As safeguards against accidents increase, atomic power plants are being permitted closer to cities than in the past. The Atomic Energy Commission, which must approve construction of such plants, judges each application on its merits. The Piqua Nuclear Power Facility (lower right) in Piqua, Ohio, produces 11,500 net electric kilowatts. It is operated by the city of Piqua for the AEC. The plant has been in full operation since January 27, 1964." The PNPF operated for several years with occasional nagging problems, particularly with control rod drives, and sometimes with the coolant. The organic substance suffered both pyrolitic decomposition (breakdown due to heat, reduced if the bulk temperature is kept below 700F, which it was, normally) and radiolytic decomposition (breakdown due to radiation). The result of this breakdown was that the coolant / moderator cracked down to substances referred to as "high boilers," which in proper conditions could lead to solidifying deposits inside the reactor, or suspended chunks in the flowing substance. The nature of the breakdown seemed to knee at something around 70 to 80 percent purity, though, so that a feed and bleed coolant replacement continuously could keep the content of the material at that percentage; higher was not possible. This in fact was what spelled the end of the project. An unplanned scram took place on January 13, 1966 and ensuing problems with rod drop testing after this forced an examination of the core. The core was defueled May - June 1966, and a "large carbonaceous deposit" discovered - which had been impeding rod motion, forcing localized boiling and high breakdown, and other problems. 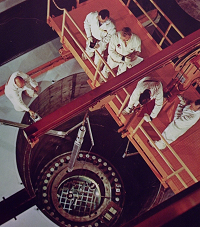 Although Atomics International developed and carried out an elaborate program to remove the deposit and clean up the entire primary coolant system over the next year, the decision was made to cancel the entire project since Piqua did not wish to pick up its option - most of these early Power Demonstration Reactor Program contracts had fixed-time letout clauses. 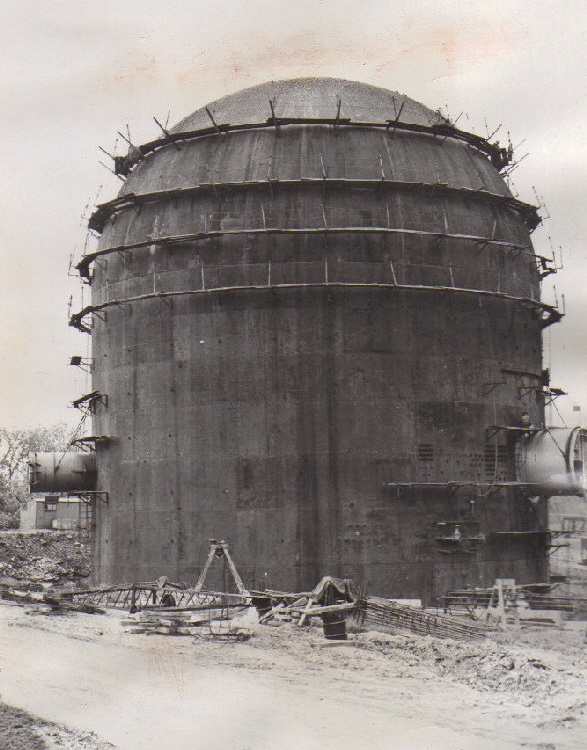 In early 1968 the AEC and the City of Piqua signed an agreement covering disposal of the facility; all fuel was removed from the site, and the plant was placed in ENTOMB status in 1969. It remains this way today. I hope you've enjoyed Carnival 141... And I hope you visit next week's edition as well. 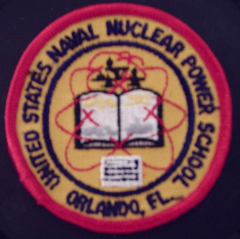 An announcement this week of a new, significant outreach project undertaken by the Nuclear Literacy Project (an outreach effort of PopAtomic Studios) has generated much excitement. The new venture, entitled "Diary of a Nuclear Tourist," will see Suzanne Hobbs Baker traveling all over Europe and visiting various sites, and meeting various people. A new blog has been launched as the first point of contact for the effort. Sponsors have lined up, and other interests are apparent. One sponsor is Fuel Cycle Week. Below is a statement from Andrea Jennetta, Publisher of FCW. Fuel Cycle Week is proud to be a sponsor of the Nuclear Literacy Project’s “Diary of a Nuclear Tourist” initiative. It is exactly the kind of creative, out-of-the-box thinking the nuclear industry needs to combat its long-suffering public image. FCW, the premier uranium business newsletter based in Washington, D.C., is not your typical industry publication. Instead, it is fresh, lively and unconventional, filled with straight industry news leavened with critical analysis, informed opinion and humor. We have opinions and are not afraid to share. FANC, the Belgian regulator, has postponed making a final decision on the restart of Doel-3 and Tihange-2, even after having received what it calls an honest and thorough document from Electrabel. FANC has made a press release in English; below is the text of the release. In the light of the detection, last summer, of flaw indications in the basic steel material of the Doel 3 and Tihange 2 reactor vessels, the FANC requested Electrabel to draw up a justification file in this respect. This file was submitted to the FANC on 5 December 2012. The FANC asked its technical subsidiary Bel V and the certified organisation for inspection of pressure equipment, AIB-Vinçotte, to assess the file. The Agency also called upon the experts of the regulators of several other countries to conduct a thorough analysis of the Electrabel file. 2) A group of Belgian professors that was mandated by the Scientific Council for Ionising Radiation. The FANC emphasizes that the licensee has performed a profound piece of work and that the information was given in all transparency. The reports are of excellent quality. At this very moment, the FANC sees no elements that would have to lead to a permanent shutdown of the nuclear power plants. Nevertheless, it has asked for additional information from the licensee before it can make a recommendation on a potential restart. Only when having examined all the data, the FANC will be able to determine whether the safety margin remained intact. As already announced on 7 August last, the FANC intends to examine all the analyses before formulating any recommendations, in line with its mission of controlling the safety of nuclear power plants. That is why the FANC asked Electrabel to provide more information in the coming weeks and to perform some extra tests. For background on this matter, see my previous post which covers Electrabel's proposal to restart the reactors (from December 21, 2012) and which contains links back to the beginning of this investigation. 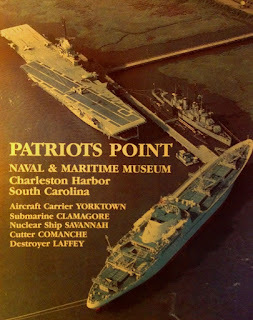 "Once Upon A Nuclear Ship"
Above, detail of poster from Patriot's Point Naval & Maritime Museum ca. 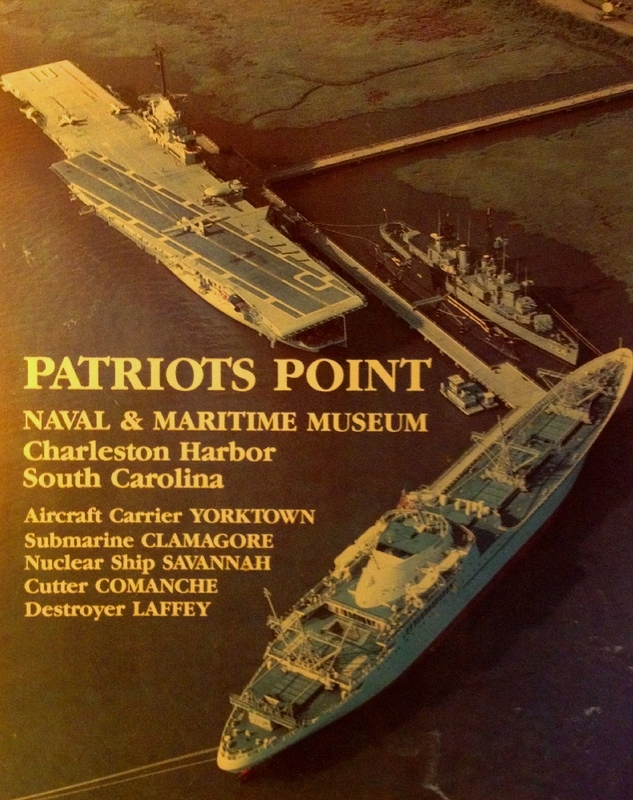 1989-1990 showing NS Savannah lower right. As a result of my interest with the ship I became aware a while back of a documentary about the ship entitled "Once Upon A Nuclear Ship." The website that explains this documentary can be found by clicking here. The project is well worth examining - it's very thoroughly researched and employs first hand experiences on the ship. Now that the documentary has been finished, the people behind it are trying to get the word out about it, and have launched a campaign to fund that effort. They've launched this campaign using a site called Indiegogo, and you can find the page for the "Once Upon A Nuclear Ship" project by clicking here. There are a range of donation amounts available for which one can receive various perks; however, it appears that the number of perks available is limited somewhat, so the early birds will get the worms as the saying goes. I would love to see this group hit its goal, and get the story of this ship out. I have always recalled the feeling of walking the Savannah's decks, and touring her spaces and quarters. I recall clearly feeling on board the ship a melancholy twinge of promise unfulfilled -- yet that promise has never been withdrawn. Nuclear propulsion for commercial shipping is just as viable, technically and economically, as it ever has been; what is lacking is proper design, proper funding, and proper incentive. Perhaps as we move toward a more carbon free and GHG free world, the emissions of the world's cargo shipping will become a significant enough point to at least put nuclear propulsion for such ships back on the table. The groundwork for any such effort has already been laid - it was laid by the men and women who designed, built, and operated the NS Savannah. The documentary which is the subject of this post should help at least to preserve the memory of that effort.